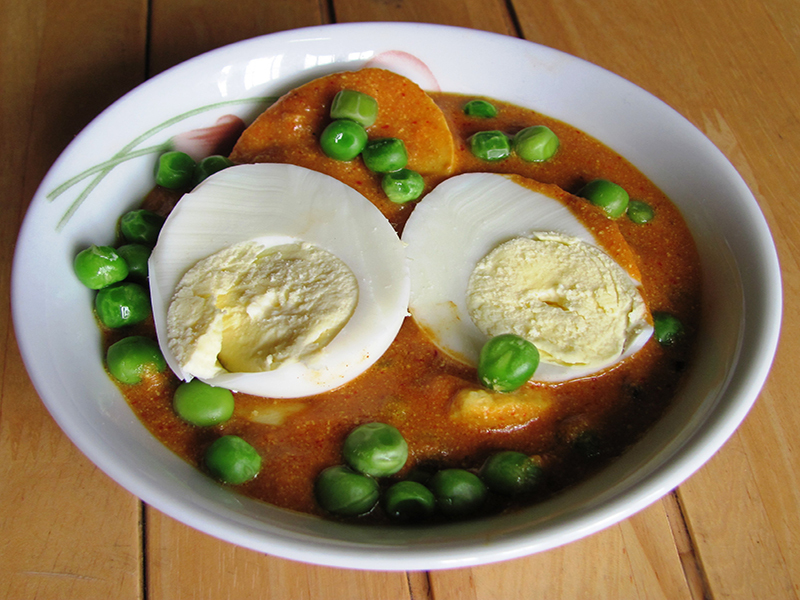 Creamy Mughlai egg curry with green peas. Korma mainly refers to a type of cooking. Mainly a korma gravy consists of yoghurt or cream with nuts and spices. To this gravy a variety of elements can be added. Like the korma gravy with vegetable gives navratan korma, with chicken it gives chicken korma and more. This is a korma gravy with eggs which very easy to make and delicious. In a wok heat 2 tbsp oil. Add the sliced onions and fry till they are light golden brown. Take it out and blend it to a smooth paste along with the cashew nuts. Keep it aside. In the same wok add the remaining 2 tbsp oil and heat it. To this add the crushed cloves, cardamom and cinnamon and green chillies. 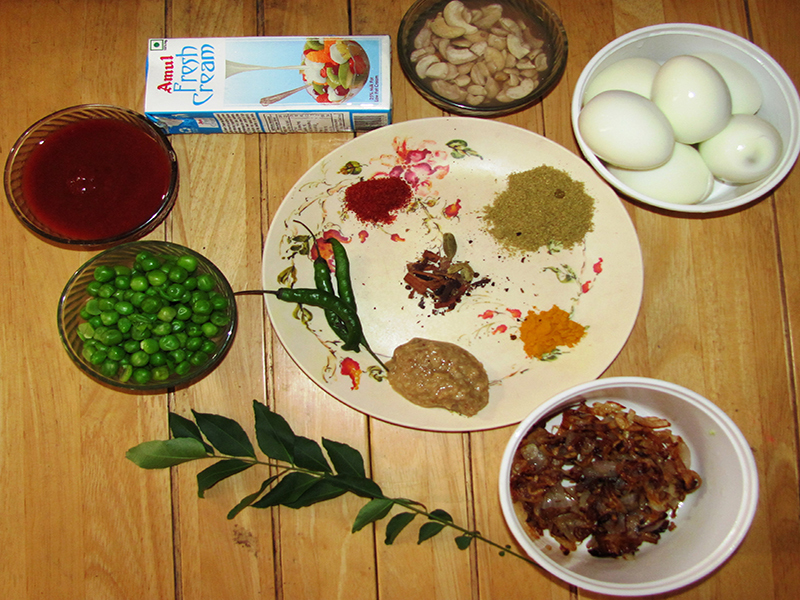 Saute for a few seconds till aromatic and add the pureed onion and cashewnut paste. Fry for a minute. Add the ginger garlic paste and fry for another minute. Next add in the coriander powder, turmeric powder, red chilli powder and curry leaves. Also add a little water so as to prevent the mixture from sticking to the bottom of the pan. Add salt and sugar and fry till the water is evaporated. Add the tomato puree and peas and cook for 3 minutes covered. Reduce the heat and add the cream. Mix it well and add the sliced eggs. Mix it well. Cook on a low heat for about a minute. Adjust the salt and sugar.